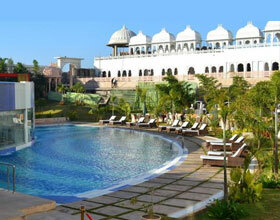 Address: Udaipur, Rajasthan 313001 India. Important : Above rates are applicable on a minimum stay for 2 nights . 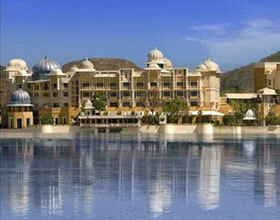 Return transfers from Udaipur airport or railway station. Breakfast at Rajput Room . 1 Traditional Rajasthanithali dinner at Neel Kamal or Jharokha . Use of Spa wet areas . 20 Percent discount on Food & Beverages (a la carte). 15 Percent on TajSpa treatments . 15 Percent on Laundry , Food , Alcoholic / non alcoholic beverage and Car rentals. Child activities –Art and craft sessions , kids movie session , dance lesson from a lead dancer & marzipan session on prior request. Note : Choose from either On booking 2 nights get 3rd night complimentary on room only basis OR 2nd room for 2 children below 12 years of age at 50 percent of the printed package offer. Taj Lake Palace Udaipur is a heritage palace hotel nestled in the calm waters of Lake Pichola, acquired by Taj Hotels Resorts and Palaces in 1971. This opulent property is an immaculate amalgamation of regal cordial hospitality and unblemished traditionally adorned staff offering flawless services to all luxe business and leisure travelers. Cradled on one of the four islands of Lake Pichola, this heritage property shares an enriched historic past reflected in its splendid architecture, mosaic designs, intricate motifs and perfect wall carvings. The vibrant colored decors narrate the captivating intimating folk tales associated with erstwhile royal residence. 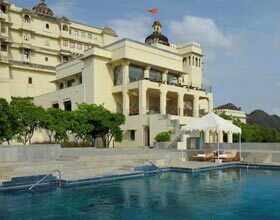 Lake Palace Udaipur exalts of its lavish green lawns, elegantly designed grand ballrooms and well appointed boardrooms, often being a host for themed weddings, gala receptions and corporate meetings. An array of recreational activities onsite is an additional bliss for resident guests. Taj Lake Palace boasts of its exquisite island location in the tranquil Pichola Lake, where guests recreate the romantic episodes of the living of Maharana Jagat Singh II. Signature Jiva Spa is a realm to resuscitate from bustling daily lifestyle with mystique therapies and traditional treatments to all its guests. 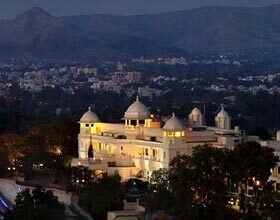 All 83 spacious accommodations of Taj Lake Palace, Udaipur formerly known as Jag Niwas are subtly differentiated into Luxury Rooms, Palace Rooms, Royal Suites, Grand Royal Suites, and the Grand Presidential Suite. Each room or suite is an exemplary specimen of finest craftsmanship of the local artisans being exhibited in awe-inspiring interiors, comfortable vintage-style furniture, and rich bright upholstery. These rooms are facilitated with all modish facilities including internet access and praises of its smoothening picture perfect vistas from arched windows. Guests relish the scrumptious delicacies at the vibrant diners of Taj Lake Palace Udaipur amidst starlit ambience, serene aura and gorgeous ornate decors of these venues. 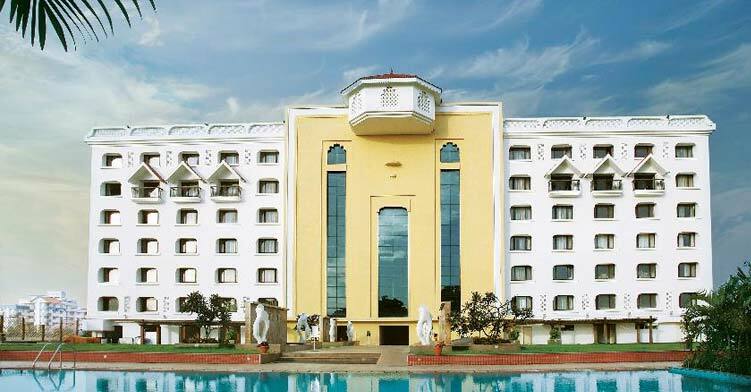 Amrit Sagar is a delight nested in the central patio to sip in the classical espressos and teas during the day and relish the exotic cocktails and Asian Tapas in the intimating evening. Bhairo is an al fresco terrace venue to enjoy modern European cuisines in the dinner under the glittering sky. Neel Kamal is an idyllic restaurant to savor the expertise of indigenous culinary techniques. Depicting the divinity of lord Shiva, this dinner restaurant prides in its intricate work on the walls. A round the clock arched structured café lounge, Jharokha with dazzling views of the Lake Pichola is a multi-cuisine eatery. 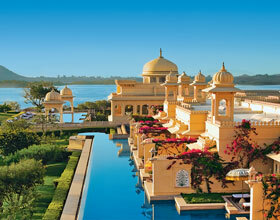 Adore the mesmerizing experience of private dining at magical sites of this palatial hotel.